Oral ulcers have several causes ranging from physical trauma to malignancy and are characterized by a loss of tissue that affects both the epithelium and underlying connective tissue, the submucosa, and even muscle or periosteum. Certain ulcerative conditions affect keratinized mucosa, whereas others are found on nonkeratinized mucosa. Oral ulcers are considered to be painful. Erosions, sometimes mistakenly referred to as ulcerations, are shallow, craterous lesions that involve only the epithelial layer with little or no damage to the underlying connective tissue. Unlike ulcers, erosions typically do not involve a yellow fibrinous slough that covers the base of the lesion; instead, erosions may appear erythemic. Diagnosis of an ulcer on oral examination should prompt the clinician to identify the specific etiology, immediately render therapy to eliminate the cause, and work with the owner to prevent recurrence. The following images of erosions and ulcerations illustrate various diseases and conditions. 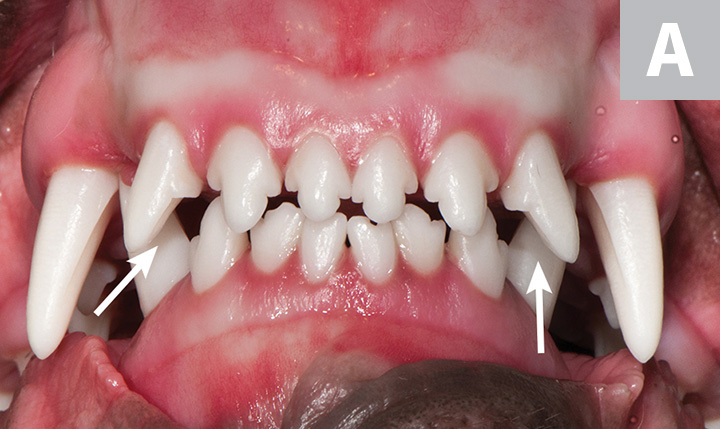 FIGURE 1A Linguoversion of the mandibular canines (arrows) in a pitbull mix with traumatic ulceration. 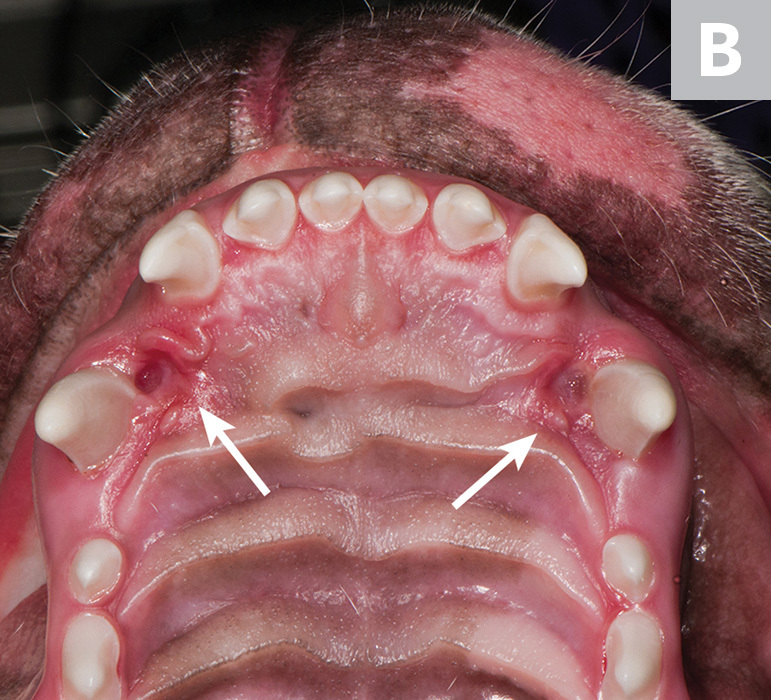 FIGURE 1B Maxillary gingival penetration (arrows) is present secondary to the mandibular malpositioned canine cusps. 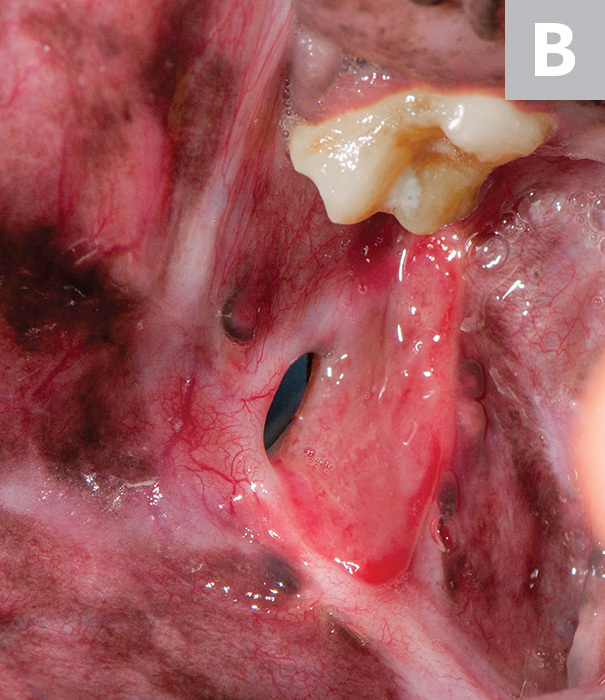 FIGURE 2 Pyogenic granuloma ulceration buccal to a cat's left mandibular molar secondary to contact of the maxillary fourth premolar. Causes for the development of traumatic occlusion may include congenital or posttraumatic malocclusion, abnormal laterolateral mobility of the mandible, occlusal drift of the premolar and molar teeth, and/or alveolar bone expansion. Successful treatment can be achieved through removal of the occlusal contact through dental extraction of the maxillary fourth premolar (preferred) or coronal reduction and restoration of the maxillary fourth premolar and excision of the prominent granuloma. FIGURE 3A Facial defect in a dog caused by oral ulceration (A), and contact mucositis (caused by irritation of the vestibular mucosa by the maxillary first molar) with ulceration (B). Mucositis can progress unabated through the mucosa, as well as through the submucosa and extending to the epidermis and dermis, as in this case. Extraction of the maxillary first molar and closure of the facial defect were curative in this patient. FIGURE 3B Facial defect in a dog caused by oral ulceration (A), and contact mucositis (caused by irritation of the vestibular mucosa by the maxillary first molar) with ulceration (B). Mucositis can progress unabated through the mucosa, as well as through the submucosa and extending to the epidermis and dermis, as in this case. Extraction of the maxillary first molar and closure of the facial defect were curative in this patient. 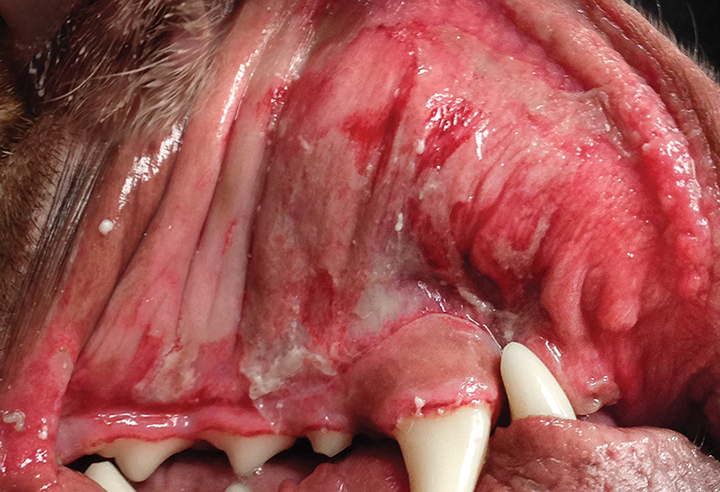 FIGURE 4 Fibrinous slough in a dog caused by contact mucositis. Fibrinous slough (ie, pseudomembrane) is a layer of coagulated fibrin, leukocytes, and bacteria overlying a badly damaged mucous membrane. It has the appearance of viable tissue. Professional dental scaling, irrigation, and polishing, along with strict home care, led to resolution of the ulceration. FIGURE 5 Eosinophilic granuloma (ie, rodent ulcer) in a cat. Eosinophilic granulomas were originally believed to be caused by rodent bites on a cat’s mouth and lips but are now known to be unrelated to rodents and instead a result of an allergic reaction, most commonly to fleas. Treatment options include elimination of allergens and treatment with antimicrobials, glucocorticoids, and laser therapy. FIGURE 6 Chemically induced inflammation and ulcers in a dog. Chemical trauma may occur secondary to oral consumption of caustic agents or as a result of an unintentional therapeutic error during dental procedures. Liquid restorative dental materials, antiseptic preparations, and endodontic products are among the most common caustic agents implicated in dental trauma. 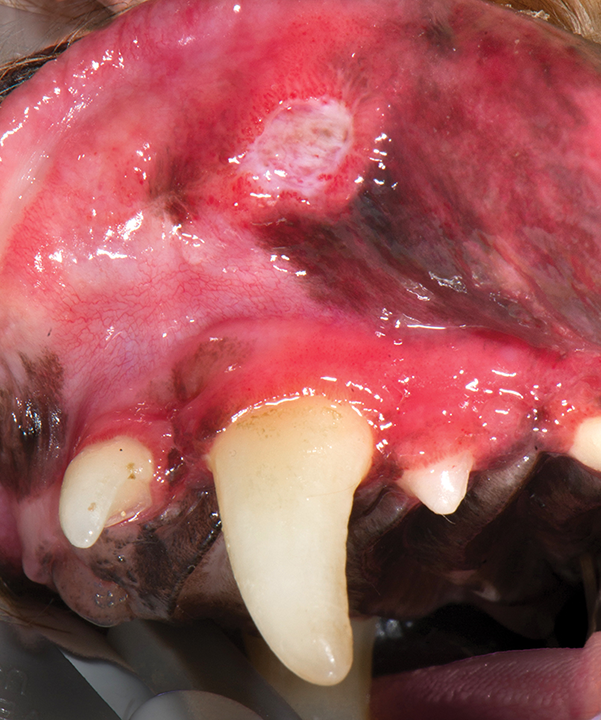 FIGURE 7 Necrotic ulceration can extend to the entire oral cavity when diffuse moderate ulceration is allowed to progress, as shown in this dog. FIGURE 8 Swelling, inflammation, and ulceration secondary to squamous cell carcinoma in a cat. 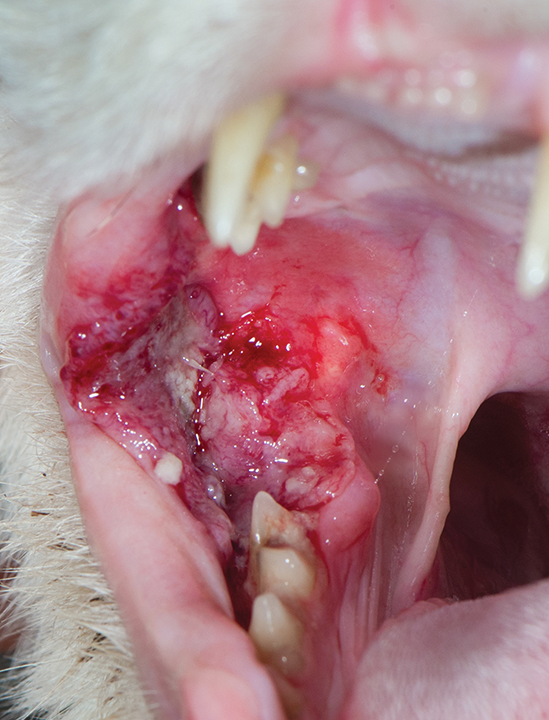 Squamous cell carcinoma is the most frequently diagnosed malignancy of the oral mucosa in cats. In the early stages, focal surface lesions may be present, whereas ulceration with induration and elevated margins is characteristic in later stages. The prognosis is poor to grave. FIGURE 9 Virus-induced lingual ulceration in a cat. Calicivirus is the most common etiology of dorsal tongue lesions in cats. In this severe case, a carbon dioxide laser was used over a 12-month span to help decrease the secondary bacterial infection, ultimately resulting in healing. 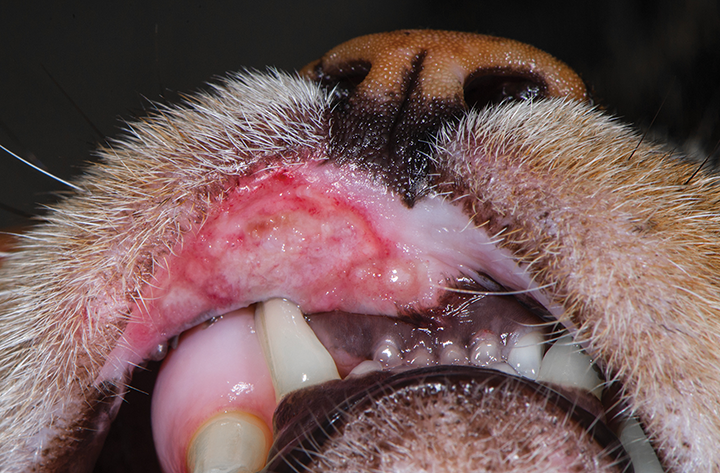 FIGURE 10 Lingual border ulceration secondary to stomatitis in a dog. Stomatitis includes inflammation of the gingiva; the buccal, vestibular, and sublingual mucosa; the tongue; and the palate. 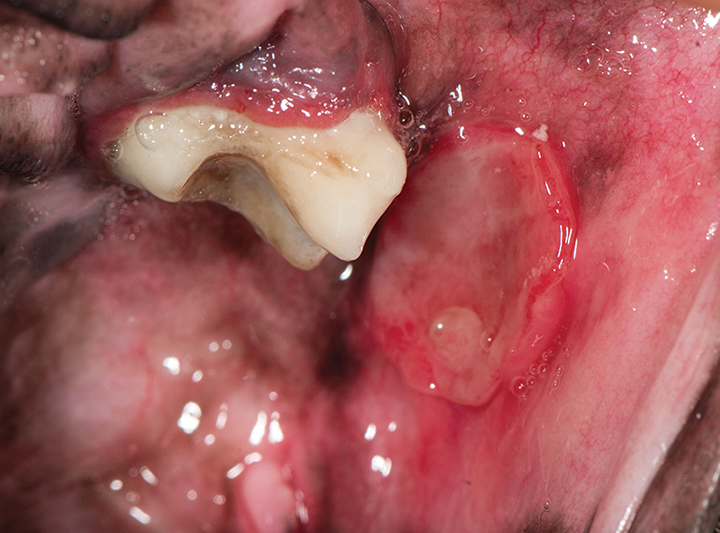 In cases of stomatitis, mucosal inflammation may range from superficial mucosal erosion to deep ulceration. 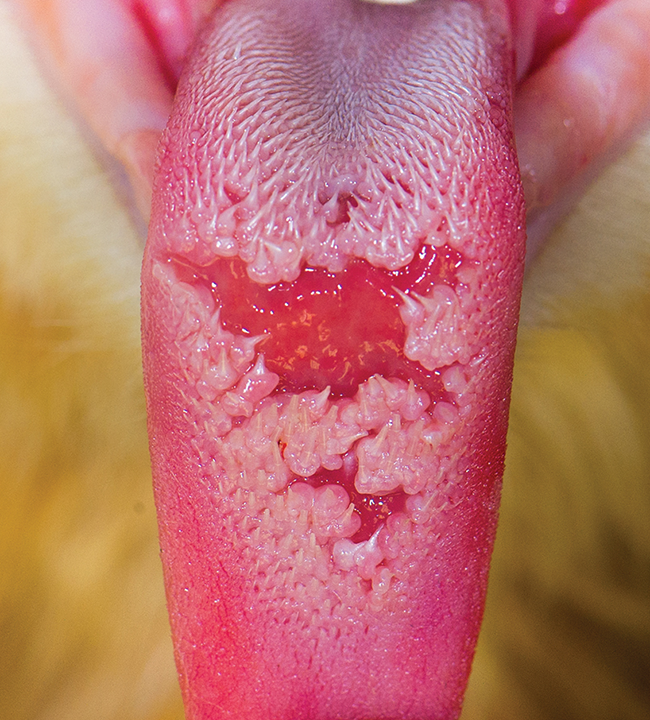 FIGURE 11 Contact mucositis with ulceration in a dog. 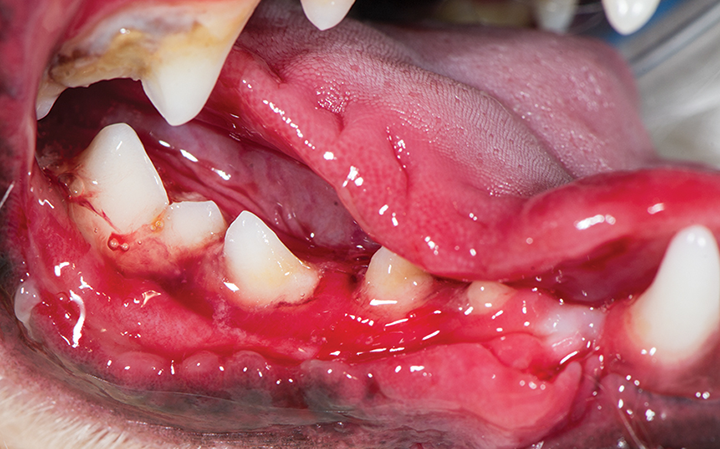 Similar to gingivostomatitis in cats, the cause of contact mucositis in dogs is believed to be a hyperimmune reaction to plaque and bacteria in the mouth. Temporary remedies to alleviate pain and inflammation can include analgesics, antibiotics, and, occasionally, immunomodulating medications (eg, glucocorticoids). However, once these medications are discontinued, clinical signs will return. 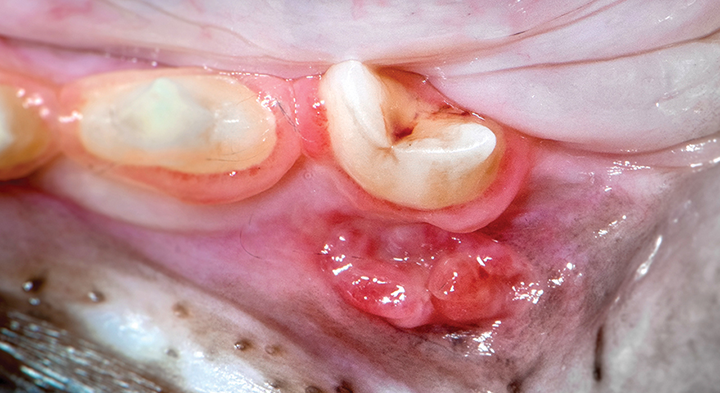 Extracting teeth that are in contact with the ulcer generally results in complete resolution. Pashley EL, Birdsong NL, Bowman K, Pashley DH. Cytotoxic effects of NaOCl on vital tissue. J Endod. 1985;11(12):525-528. Porter SR, Leao JC. Review article: oral ulcers and its relevance to systemic disorders. Aliment Pharmacol Ther. 2005;21(4):295-306. Rawal SY, Claman LJ, Kalmar JR, Tatakis DN. Traumatic lesions of the gingiva: a case series. J Periodontol. 2004;75(5):762-769. Riehl J, Bell CM, Constantaras ME, Snyder CJ, Charlier CJ, Soukup JW. 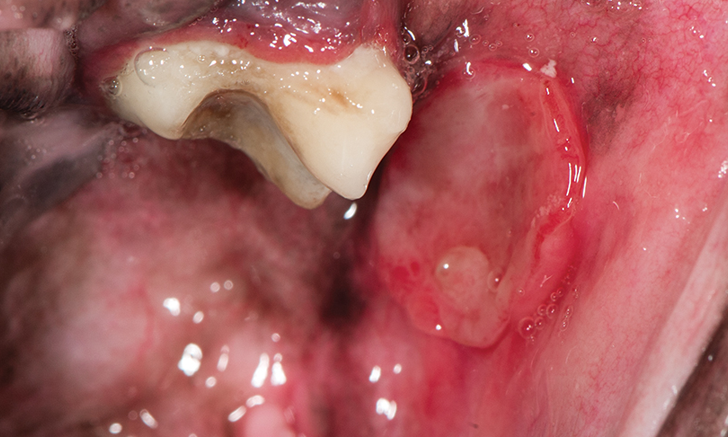 Clinicopathologic characterization of oral pyogenic granuloma in 8 cats. J Vet Dent. 2014;31(2):80-86.